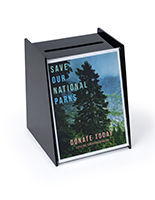 Employee suggestion boxes are an essential feature for any workforce that hopes to improve upon their effieciency, culture, and performance. 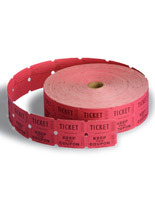 Use these anonymous suggestion systems to receive employee request and build a more successful, supportive, business environment. 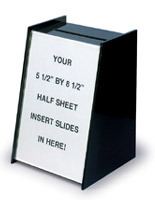 Fixtures measure 5-1/2" by 8-1/2" and have a 4" wide front facing acrylic pocket to insert custom graphics, to better inform employees of current topics and events that need private opinions. 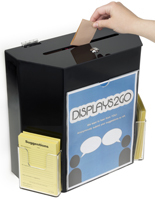 After a quick and easy ordering process and delivery, our Nursing Facility is enjoying our 2 new suggestion boxes. Both are exactly as expected from the online description, so I'm totally satisfied with the product... exactly what I was looking for. My only complaint would be that they were more expensive than I expected... must have a decent margin. Thanks for the great review, Scott! 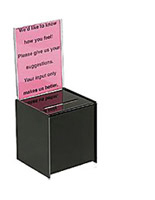 We're glad that these suggestion boxes were an excellent solution for your Nursing Facility, and that you're overall satisfied with the product and our service. We always strive to provide high-quality products at competitive prices, and we appreciate your feedback. Thanks again! We have eleven stores and wanted to capture our customer's experience. 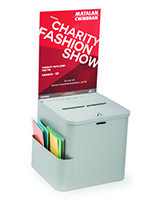 We purchased these ballot boxes with sign holder and side pocket and placed them on every counter. The boxes are eye catching and the response has been great! 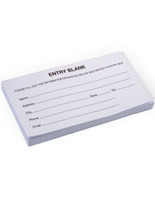 This will help us improve our customer's experience and also capture contact data for our newsletter and specials. 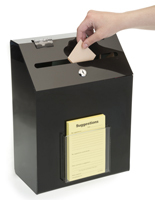 Victor, we're so happy to hear that these ballot boxes have been successful in collecting feedback from your customers and capturing contact data for your marketing efforts. Thank you for the wonderful review, and for taking the time to share your photo! Really like the compact design of this product and the quality seems good. With the added side pocket it makes for a handy display. 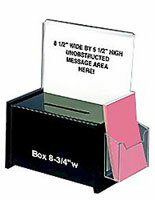 Would prefer the main base have something to keep it from sliding on smooth surfaces and would also like to see the side pocket slightly wider to accommodate 4x6 cards. Thanks for the thoughtful feedback, Penny! We're sending your feedback along to our product development team to review. Thanks for shopping with us! Perfect size for what we need! 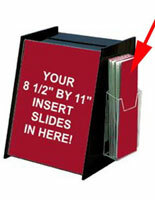 These boxes are sturdy and the perfect size for what we need. The reason I did not give it a 5 star is because the thing (clasp, lever) on the back to open up the box is really tight and hard to use, especially since we want kids opening them. We're glad we had just what you needed! Thanks so much for your feedback and taking the time to review. The box is stealth, sturdy, and very slick looking. 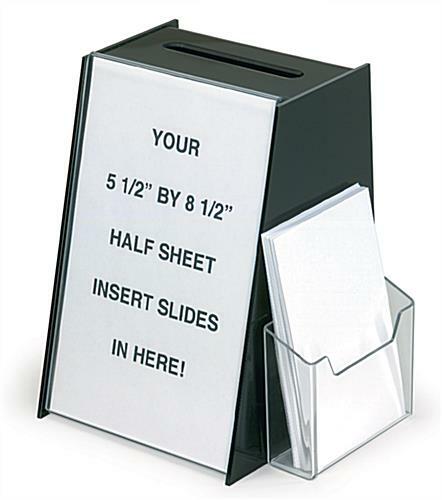 We use it at our company as a weekly "suggestion box". I'd highly recommend, and that's after having compared many of these types of boxes. Thanks for sharing your review and photo, Donelle!